Entrepreneurs need motivation, perhaps more than most people. Motivation, knowledge and information to remain on the right track. The track that leads to SUCCESS. If you are looking for Entrepreneur quotes and wisdom: look no further. Here are 60 Entrepreneur quotes in pictures. 1. I WILL win, maybe not immediately, but absolutely and definitely! 2. I don’t care how many have failed before me. They are not ME. 4. Do what you love and you will never WORK a day in your life. 5. “You don’t have to know HOW you are going to do it, you just have to know you ARE going to do it!” Make the choice, TAKE ACTION and learn along the way. 6. Dear past: Thank you for all the lessons. Dear FUTURE: I AM READY! 7. I didn’t ask for average and i will NEVER settle for it! 9. Mark my words… You will remember my name! 10. Don’t fear failure. Fear being in the exact same place next year, as you are today. 11. Rain, hail or shine… SUCCESS is mine! 12. The greatest dreams are always considered “Unrealistic” to those with NO AMBITION. 13. Failure is not the END of your story. It’s the start of your comeback story! 14. You have to know YOUR worth before you can be worth anything. 15. Dear obstacle: I WILL DESTROY YOU! 16. Don’t Give Up! – Your future self. 18. “Gee i’m glad i took the easy road”…. Said no successful human, ever! 19. Don’t just DREAM your dreams. Make them your REALITY by PLANNING for them and WORKING for them. 20. Success is what happens AFTER you have survived all of your disappointments. 21. Be grateful for all you have, but NEVER SETTLE for less than you can be. 22. Create a better future tomorrow, by working like a BEAST today. 23. If it doesn’t CHALLENGE YOU, it won’t CHANGE you. 24. AMBITION is my drug. SUCCESS is the only cure. 25. Anything is possible for those with a dream, A PLAN, and the WILL to make it happen! 26. 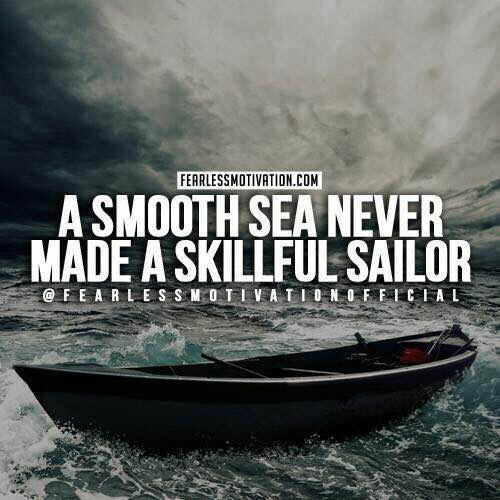 A smooth sea never made a skilful sailor. Expect challenges and embrace them on your journey, it is the toughest of challenges that grow us the most. 27. Don’t be upset about the results you didn’t get, from the work you didn’t do. 28. You can’t fake RESULTS. It’s what separates the TALKERS from the WORKERS. 29. Life is too short to be working for someone else’s dream. 30. Keep your mouth shut and WORK, let your success make the noise. 31. “I am not what happened to me. I am what i choose to become” – Carl Jung. 32. My life hasn’t been easy, but i’m not about to make it harder by taking it easy. 33. You can’t soar like an eagle when you are surrounded by turkeys. Choose your circle wisely. 34. The 10 Keys to SUCCESS. 35. Great things don’t come to those who wait. Great things come to those who go out and EARN IT. 36. Have the courage to go after your dreams, or live with the regret for not doing so. 39. The person you will be in 5 years is based on the books you read and people you surround yourself with today. 40. Starve your distractions and FEED YOUR FOCUS. 41. NO EXCUSES! It doesn’t matter where you are or where you have been. The only thing that matters is you know where you are going! 43. My greatest asset is my BELIEF in myself! 44. To those who doubted me: I will prove you wrong. To those who believed in me: I will prove you RIGHT! 45. They laugh at me because i’m different… I laugh at them because they’re all the same. 46. Money isn’t everything… but i’m going to make a fortune anyway… just in case! 47. If it doesn’t work out the first time, keep going until the time it does work out! 48. Every morning when your feet hit the floor, tell yourself TODAY WILL BE THE DAY! 49. Every successful person was once an unknown person that REFUSED to give up on their dream. 50. Do what the average FEAR and SUCCESS will be near! If you want what others don’t have, you must be willing to do the things others won’t do. 51. Spend 50 weeks a year doing something you hate, so you can spend 2 weeks relaxing… No thanks! 53. I would much rather work 16 hours a day for myself, than 8 hours a day working for someone else. 54. All of those late nights and early mornings will pay off, but ONLY if you KEEP GOING. 55. If someone else has done it, you can too! No one starts off successful. You take the first step and you keep on working. 56. SUCCESS is NEVER given, it is always EARNED! 57. If you are continuing to see more STRESS than SUCCESS it means your FOCUS is more on the PROBLEMS than the SOLUTIONS. 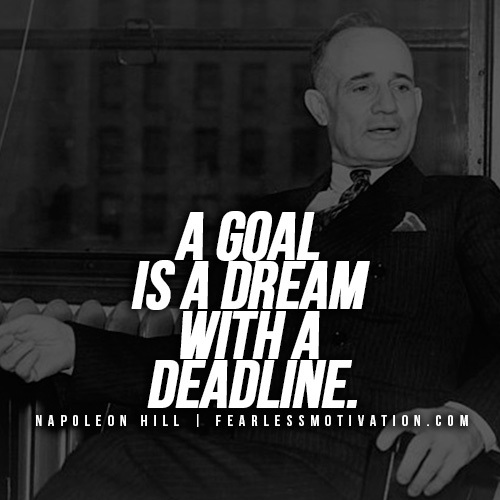 Set GOALS and FOCUS on how you can make those goals your REALITY. 58. If it doesn’t A) Make you happy. or B) Make you better… Don’t make time for it. What is your favourite Entrepreneur Quote? Share it in the comments below. Thanks for the quotes. Need this!! Great quotes! I’m totally sharing these to motivate others and hopefully they’ll visit your website as well. That’s your collected quotes really inspirational. It makes the people for working hard for success. Awesome quotes, very inspirational specially to those tired and wan’t to give up.